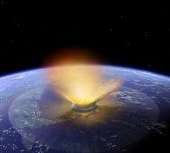 Did a Pacific Ocean meteor trigger the Ice Age? (Phys.org)—When a huge meteor collided with Earth about 2.5 million years ago in the southern Pacific Ocean it not only likely generated a massive tsunami but also may have plunged the world into the Ice Ages, a new study suggests. A team of Australian researchers says that because the Eltanin meteor – which was up to two kilometres across - crashed into deep water, most scientists have not adequately considered either its potential for immediate catastrophic impacts on coastlines around the Pacific rim or its capacity to destabilise the entire planet's climate system. "This is the only known deep-ocean impact event on the planet and it's largely been forgotten because there's no obvious giant crater to investigate, as there would have been if it had hit a landmass," says Professor James Goff, lead author of a forthcoming paper in the Journal of Quaternary Science. Goff is co-director of UNSW's Australia-Pacific Tsunami Research Centre and Natural Hazards Research Laboratory. "But consider that we're talking about something the size of a small mountain crashing at very high speed into very deep ocean, between Chile and Antarctica. Unlike a land impact, where the energy of the collision is largely absorbed locally, this would have generated an incredible splash with waves literally hundreds of metres high near the impact site. "Some modelling suggests that the ensuing mega-tsunami could have been unimaginably large – sweeping across vast areas of the Pacific and engulfing coastlines far inland. But it also would have ejected massive amounts of water vapour, sulphur and dust up into the stratosphere. "The tsunami alone would have been devastating enough in the short term, but all that material shot so high into the atmosphere could have been enough to dim the sun and dramatically reduce surface temperatures. Earth was already in a gradual cooling phase, so this might have been enough to rapidly accelerate and accentuate the process and kick start the Ice Ages." In the paper, Goff and colleagues from UNSW and the Australian Nuclear Science and Technology Organisation, note that geologists and climatologists have interpreted geological deposits in Chile, Antarctica, Australia, and elsewhere as evidence of climatic change, marking the start of the Quaternary period. 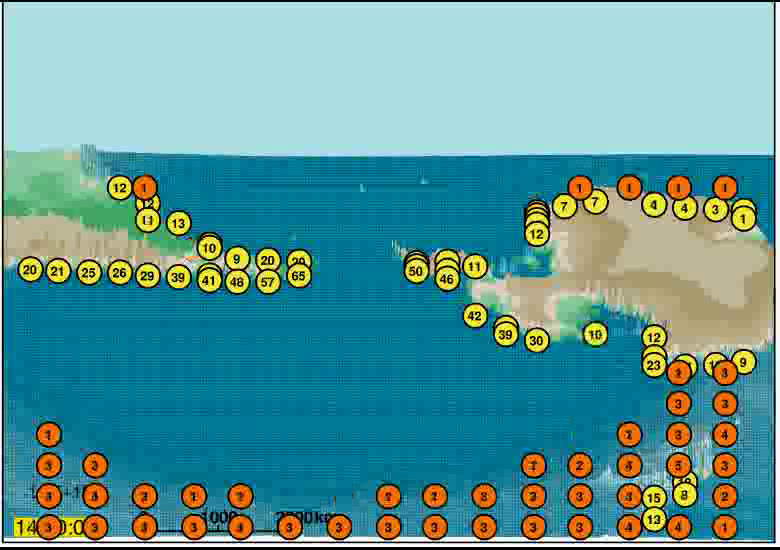 An alternative interpretation is that some or all of these deposits may be the result of mega-tsunami inundation, the study suggests. "There's no doubt the world was already cooling through the mid and late Pliocene," says co-author Professor Mike Archer. "What we're suggesting is that the Eltanin impact may have rammed this slow-moving change forward in an instant - hurtling the world into the cycle of glaciations that characterized the next 2.5 million years and triggered our own evolution as a species. "As a 'cene' changer - that is, from the Pliocene to Pleistocene - Eltanin may have been overall as significant as the meteor that took out the non-flying dinosaurs 65 million years ago. We're urging our colleagues to carefully reconsider conventional interpretations of the sediments we're flagging and consider whether these could be instead the result of a mega-tsunami triggered by a meteor." The key word here is "trigger". The evolution of ice ages is known to be driven by periodic changes in the earth's orbital and rotational elements. The system tends to want to remain static however, so there is generally a delay in the transition into and out of Glaciation events. What "triggers" the rapid onset, and ending of glaciation is however unknown, and will differ from glaciation event to glaciation event. As the delay into and out of each glaciation cycle increases, the strength of the trigger needed to cause the transition decreases, to that eventually trivially small changes in weather will ultimately be the cause if there is no other trigger. At 2km, the bolide wasn't large enough to cause an ice age. The near coincidental Chesapeake Bay (~4km bolide) and Popigai (~5km bolide) impacts at 35My only caused regional climate disruption. They produced craters 85 and 100km in diameter, respectively. They predate the glaciation of Antarctica by one million years and may have occurred simultaneously, occurring plus/minus 400,000 years of each other (which is within the error of measurement). Dark matter is striking us all the time and the only result is an imperceptible warming from when they, very rarely, strike a nucleus head on. Dark matter is dark because it interacts weakly with baryons and itself; it can't build meteorites. The Eltenin impact on the other hand was recognized by the usual impact marker, iridium, in sea bottom cores. If there was any evidence that dark matter was actually matter, and not a theoretical artifact, I would be much more supportive of your claim. Dark "Matter" is called "matter" because of the gravity field associated with it. It could have been called "Dark Gravity" or "That Which Is Responsible For All That Extra Gravity" as well.